Eggplants are an extremely versatile vegetable. Named for the white, egg-shaped variety, they come in different shapes and sizes. They can be used in soups, dips, and casseroles, on pizzas and pasta. They can be sauteed, roasted, fried, broiled, stuffed, rolled, breaded, and sauced. 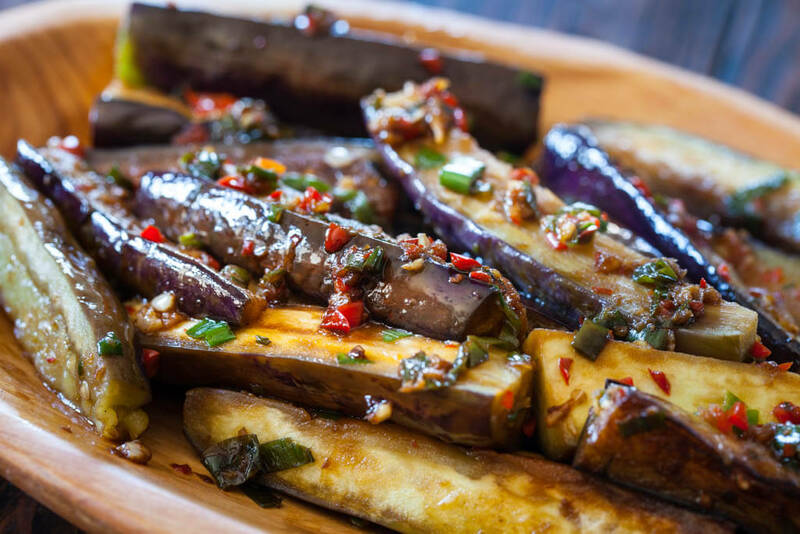 Eggplants are an excellent food to add to your culinary repertoire; they add flavor and diversity to your palate, and at no cost to you, in terms of fat content. One cup cooked eggplant contains: 1 g protein; 6 g carbohydrates; 5 mg calcium; 22 mg phosphorus; 238 mg potassium; 3 g dietary fiber; 6 RE vitamin A; 1 mg vitamin C; and small amounts of niacin, iron, thiamin, and riboflavin. Studies in China have linked eggplants to lower rates of stomach cancer. This is probably because eggplants contain a lot of flavonoids, which are cancer-fighting antioxidants. 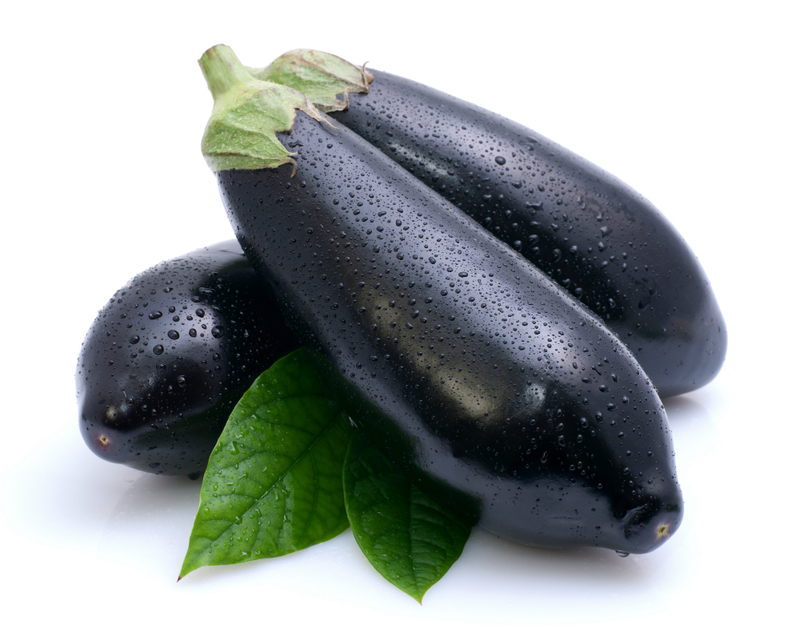 Eggplants have been shown to have antibacterial and diuretic properties, and may even lower blood cholesterol. Eggplants also contain a substance called glycoalkaloids, which have been made into topical creams to treat skin cancers. However, solanine is a glycoalkaloid, which have been linked to allergic disorders, inflammation in arthritis sufferers, and interference with anesthesia. 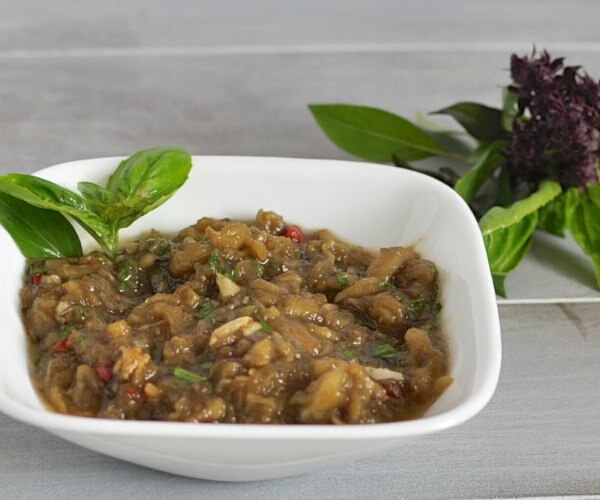 In addition, according to Health World Online (www.healthy.net), people taking MAO Inhibitors should limit their intake of eggplants (among other things). Studies are currently being done on the effects of solanine. But we're talking very specific situations here. Unless you are in these particular circumstances, eggplants are more than worthy of being part of our regular diets. 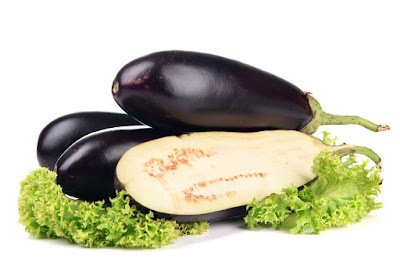 There are many different types of eggplants. There is the kind Americans are most family with, the American, or globe eggplant. There are also Italian, Japanese, Chinese, Filipino, Green Goddess, Hawaiian, Holland, Indian, Rosa Bianca, Sicilian, Thai, white, and baby eggplants. Some are more available than others. No matter which kind you buy, eggplants should have glossy, smooth skin with no blemishes. They should feel firm and heavy for their size. Keep them in the refrigerator, preferably in the vegetable crisper, and away from tomatoes and apples—which emit ethylene gas—since they are ethylene-sensitive. Eggplants can be used peeled or unpeeled, depending on the dish and on your tastes. Older eggplants often benefit from salting to drain the bitterness. To do this, slice the eggplant, layer the slices in a colander, and lightly sprinkle each layer with salt. Let this sit about 30 minutes, then lightly rinse and dry the slices. Discard the liquid. Smaller, younger eggplants usually don't need salting. Below are some recipes. Enjoy! Score cut sides of eggplant in a cross-hatch pattern and sprinkle with salt. Let eggplant stand 30 minutes. Rinse eggplant and pat dry. In a small bowl whisk together garlic, soy sauce, vinegar, and sesame oil. Arrange eggplant, cut sides down, on oiled baking sheets and brush skins lightly with vegetable oil. Broil eggplant 3 to 4 inches from heat until skins are softened, 3 to 4 minutes. Turn eggplant and brush lightly with more vegetable oil. Broil eggplant 3 to 4 minutes, or until flesh is golden. Transfer eggplant with a slotted spatula to a platter and brush with garlic sauce. Brush both sides of each eggplant slice with oil (optional, broiling can be done without oil). Arrange on broiler tray or cookie sheet and broil under high heat until browned. Turn and brown other side and set aside. Preheat oven to 350 degrees. Mix Tofu, Parmesan cheese, parsley, garlic powder and egg. Set aside. To assemble, first sprinkle the bottom of a rectangular baking dish with half of the crumb mixture. Arrange slices of broiled eggplant around the pan and fill the spaces with the Tofu-cheese mixture. Cover with slices of onion, green pepper and mushrooms. Repeat until all eggplant is used. Sprinkle with remaining crumb mixture. Spread a layer of sliced cheese. Top with spaghetti sauce. Bake for 45 to 55 minutes or until brown and bubbly. Serve with green salad. Serves 6 to 10 people. Preheat oven to 425`. Pierce eggplant several times with a fork, and wrap in foil. Place eggplant on a baking sheet, and bake at 425` for 1 hour. Cool slightly. Peel, seed, and mash eggplant with a potato masher. Combine raisins and water in a small bowl. Cover with plastic wrap; vent. Microwave at high 30 seconds. Let stand, covered, 10 minutes; drain. Add raisins, basil, and next 5 ingredients (basil through garlic) to eggplant. Preheat broiler. Sprinkle pitas with cheeses, and broil for 2 minutes or until cheese melts. Cut each pita into 6 wedges, and serve with eggplant dip. Yield: 24 servings (serving size: 1 pita wedge and 1 tablespoon dip).